Samsung BioLogics Co., a biopharmaceutical business arm of South Korea’s top conglomerate Samsung Group, vowed stronger performance to appease jittery shareholders as the stock recently took fresh beating from renewed raid from authorities over accounting irregularities. It promised to bump up the number its contracts to 39 from 27 this year, and eventually occupy half of the global CMO market by 2020. The bold plan was unveiled during a shareholders’ meeting held on Friday, where Samsung BioLogics chief executive Kim Tae-han reiterated that the company has committed no wrongdoing and will prove so through administrative court battle with the financial authority. The stock lost over 9 percent over the last two weeks after prosecution last Monday reopened a new case into the bio firm and other key Samsung companies suspecting ties in dubious bookkeeping to succession of Samsung Group heir Jay Y. Lee. Samsung BioLogics shares closed Friday down 2.58 percent at 339,500 won ($300). Samsung Corp, Samsung Electronics, and owner family members own a combined 75.11 percent in the youngest Samsung unit groomed as the future growth engine for the country’s largest corporate empire. Last November, Korea’s top financial regulator concluded Samsung BioLogics intentionally breached accounting rules by changing the valuation method of its stake in a joint venture to inflate its profits ahead of an initial public offering in 2016. Its shares have plummeted nearly 15 percent since May 2018 when regulators opened an investigation into the allegations. 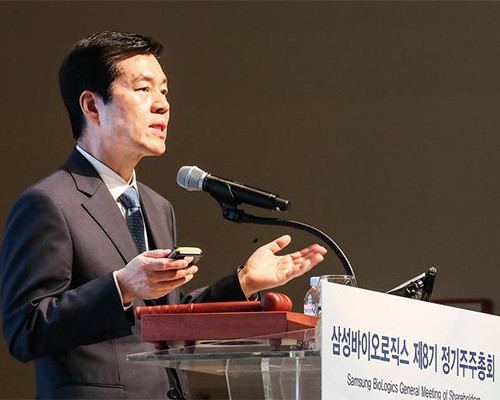 “Samsung BioLogics took top position in terms of production volume just eight years after its foundation, beating out a long-time champion, which operates over 30 years,” he told shareholders. “We will keep going as a global top player with a dual focus on CMO and CDO. Under the company’s detailed business plans and goals this year, Samsung BioLogics will increase the number of CMO contracts for biopharmaceutical production at its three plants by 12 to 39. By the end of this year, it wants to obtain contracts that could represent over 50 percent of the capability at its third plant. It will also secure 24 projects in CDO and CRO areas, while aiming to obtain 50 plus CDO contracts by 2020. The company’s ultimate goal is to occupy the half of the global CMO market, Kim emphasized. Kim also hinted at business diversification to producing or developing antibody drugs, cell and gene therapies and vaccines beyond CMO and CDO business.